After years of planning and discussion, a project to pave one of two "Sellwood Gap" sections of the Springwater Corridor Trail began in March. Community members learned about both "gap" segments at two meetings, one held on February 18, and the other February 27, both of them at Sellwood's SMILE Station. At the first meeting, SMILE Transportation Committee Chair Scott Kelly hosted Metro's parks and trail planner Mel Huie, and Portland Parks & Recreation's (PP&R) Maya Agarwal. "This evening, Huie and Agarwal are talking about the last segment of the unimproved section of the trail," Kelly announced. "Tonight's meeting is to discuss what is in the works for the last piece of the gap, now in the preliminary engineering stage; this evening, primarily focusing on the intersection at S.E. 17th Avenue at Ochoco Street, not the project closer to the Sellwood Bridge." As the meeting got underway, twenty five people had arrived to learn more about this part of the project. "Now, after 30 years of working on this project, we're entering the final phases of improving the entire Springwater Corridor Trail," Huie began. "Thanks to cooperation of Richard Samuels of Oregon Pacific Railroad, the tracks in the area have been moved, allowing for the trail to be built alongside, in the right of way. PP&R and Metro are working to get federal funds for this segment of the project. 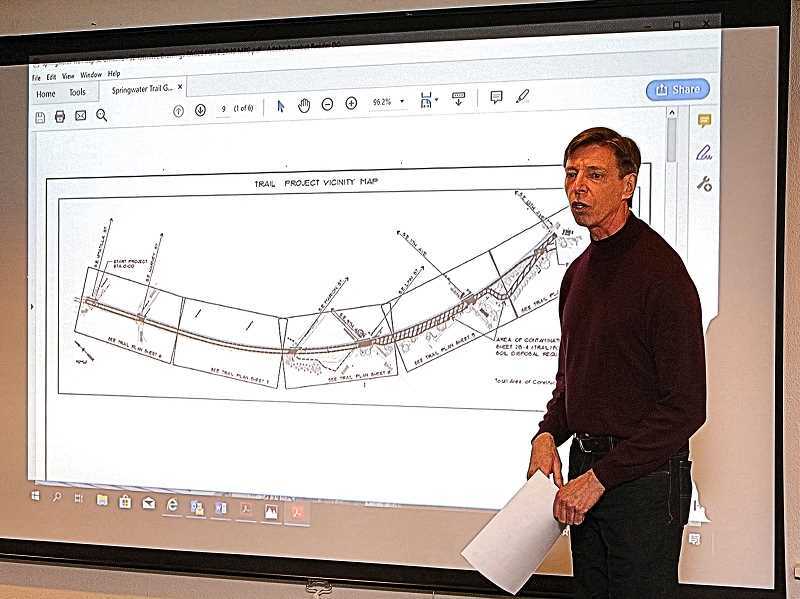 "Most of the tracks of been pushed to the south side; plans are to flatten out the berm that raises up north, pave it, and then put in a dividing fence, much like what was done along the Springwater Corridor Trail in Oaks Bottom," Huie explained. However, there may never be a direct transition from the trail leading west from the trail's "Three Bridges" section at McLoughlin Boulevard to somehow parallel S.E. Ochoco Street, and cross 17th Avenue, heading toward Oaks Bottom, he said. "The Oregon Department of Transportation controls the railroad crossing," he explained. "Officials just don't want bicycles crossing the street at this intersection; their plan is to have them jog north a block to S.E. Lynn Street, cross 17th Avenue, then go west for a couple blocks before rejoining the trail." Until this segment is completed, riders and walkers will take an on-street detour that starts at S.E. Umatilla and heads east, and then south on 19th Avenue, connecting with the "Three Bridges Section" and the rest of the Springwater Corridor Trail. At the February 27 meeting, PP&R Project Manager George Lozovoy said the Bureau had begun construction on the "S.E. Umatilla to 13th Avenue Trail Project". "It will provide an off-street, rail-with-trail, shared-use 12-foot pervious asphalt path parallel to the Oregon Pacific Railroad mainline track," Lozovoy said about this 2,700-foot-long segment of the trail. "One purpose of this meeting is to talk about the construction impacts of the project; for example, there will be flagging when concrete trucks are delivering concrete and asphalt trucks are paving the trail," Lozovoy told THE BEE as 25 people were seated and the meeting got underway. "Instead of having gravel or rocks that quickly become overgrown, there'll be a one foot paved shoulder on each side of the trail," Lozovoy began. Edith Mirante, a neighbor whose residential property is separated from the trail and railroad line by a Metro-owned greenway near the intersection of S.E. 9th Avenue and Linn Street, arose to protest cutting trees to complete the trail in that area. "These are wonderful, mature trees," she said. Lozovoy explained that they needed to be removed in "order to provide a safe and functional trail." Another neighbor questioned the wisdom of adding "sidewalk curb cuts" along this segment of the trail – because there are no sidewalks in the area, and several of the streets are unimproved. The curb cuts at the primarily entering and exiting locations, Lozovoy responded. "And, installing them is required by the code; this project is treated like any other developer in any area where they're making improvements," he said. "The sidewalk curb cuts will only be on the trail portion."